In brief, Vietnam visa-on-arrival is a process of obtaining the pre-approved visa letter (visa approval letter) through a travel agency in Vietnam to check in at the departure airport and pick up the actual visa stamp at an international airport in Vietnam upon arrival. Most visitors to Vietnam require a valid visa to visit the country and are eligible to apply for a visa on arrival as long as they enter Vietnam by air at one of the International airports in Vietnam. Step 1: Apply online for an approval letter, which may take 3-5 working days for standard processing and 8 working hours for urgent processing. Step 2: Receive the approval letter by email and print a hard copy. Prepare 2 passport sized photos, your passport (must be valid for at least 6 months at time of entry) and stamping fee of 25 USD (for single entry visa) and 50 USD (for multiple entry visa) in cash. Step 3: Present all above mentioned documents to get your visa stamp upon arrival at an international airport in Vietnam (Hanoi, Ho Chi Minh city, Nha Trang, Hai Phong and Da Nang). That it is! Convenient - Everything will be done online, no passport sendoff, no documents required. Low cost - Relatively cheap in compared to other methods of getting a visa to Vietnam. Fast - In emergency cases, it is possible to obtain a visa approval letter in just 2-3 hours. Unlike other countries (Cambodia, Thailand..ect) where you can get the visa the directly at border gates upon landing, for Vietnam visa on arrival you are required to apply for a pre-approved visa letter through a Vietnamese agency in order to pick up the visa stamp on arrival. The 15 day free visa exemption has been extended to June 2020 for the passport holders from United Kingdom, France, - Spain, Italy and Germany. Travellers from these countries can travel to Vietnam without a visa for 15 days, longer term visas can be obtained through visa on arrival or at the local embassy. 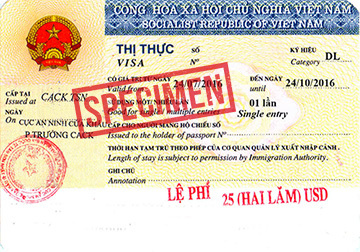 As of November 2014, foreign travellers who fly directly to Phu Quoc island will no longer require a visa. Recommended reading: 5 Common Mistakes People Make When Applying for a Visa on Arrival to Vietnam. Visa on arrival is applicable for air travel only. If you enter Vietnam by land or cruise, you are required to obtain a full visa before you arrive. Your passport must be valid for at least 6 months beyond your planned stay in Vietnam. If you travel with children having their own passports, you are also required to pay the same fees as adults. The stamping fee at Vietnam airport is payable in cash only, no credit cards are accepted. There is NO OFFICIAL website for visa on arrival service. All websites offering the pre-approved visa letter are private agencies. Do not get confused by bulk of websites with organizational internet domain TLDs (org, gov..ect). 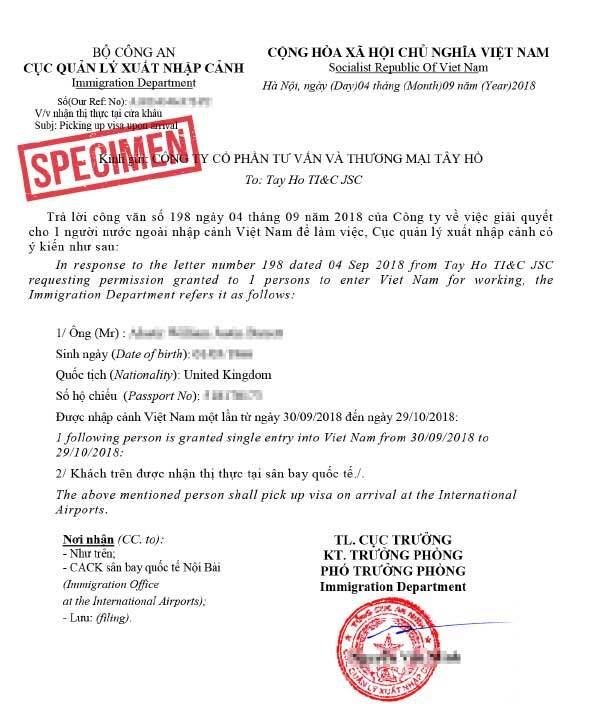 With the approval letter (Image 1) that you obtain through our service, you are able to get your visa stamp (image 2) on arrival at Vietnam airport. A foreign national traveling to Vietnam to conduct temporary business needs to apply for a business/working visa (categorized under LD/DN visa type). Please check out business visa page for details. The visa on arrival fee will depend on the type of visa you are applying for, below is a sample fee for tourist visa on arrival. The stamping fee is payable by cash at Vietnam airport in Vietnamese Dongs and US dollars (credit cards are not accepted). Please see our fee page for more detailed instructions. YES – it is as the Issuing authority is the Immigration Department. Vietnam visa upon arrival at Phu Cat airport? Answer: As the visa will be stamped on your passport upon landing at Hanoi airport, you are able to travel any where in Vietnam (including resort in Quy Nhon) without any problems. How long does it take to get my visa stamp at the airport? 40% of the customers: Waited less than 15 minutes. 40% of the customers: Waited for 15-30 minutes. 15% of the customers: Waited 30 minutes to 1 hour. Prepare all documents before you arrive. Prepare the exact amount for the stamping fee. Prepare the stamping fee in cash either in Vietnamese Dong or US dollars. Rush out the airplane as soon as possible to be the first come first serve. If you are travelling with children or elderly people, ask the officers for priority. Should I use "fast track" service to avoid the queue? No, we do not offer fast-track service and we do not recommend you to purchase it as we believe that it is NOT a "FAIR" service. If you travel with children or are in emergency cases, you can ask the officers or other applicants for priority. Kindly check out detailed guide on wait time at Vietnam airport. Can I can get the visa directly at Vietnam airport? No, you can not. In order to obtain your visa on arrival, you must apply online for an approval letter (pre-approved visa letter) through a travel agency. I pay online already, do I need to pay on arrival as well? Service fee: Payable online for our company to obtain your the letter of approval. Stamping fee: Payable by cash at Vietnam airport when you arrive. Kindly check out the fee page for more details. Can I get a photo when I arrive? There is currently no photo boot at Vietnam airport, we strongly recommended that you have your photos taken before you go. Some of our customers reported that they were able to get their photos taken at Vietnam airport for $2 US/each through an unprofessional photo service. Can I extend my visa once I am in Vietnam using this visa on arrival?